Trying wines under $10 from different parts of the world (translation: outside of the world of California) is a no brainer for me. A cheap tasting will easily take the place of movie night, happy hour in Minnesota in January (translation: I don’t have to go outside) and doing work at home. 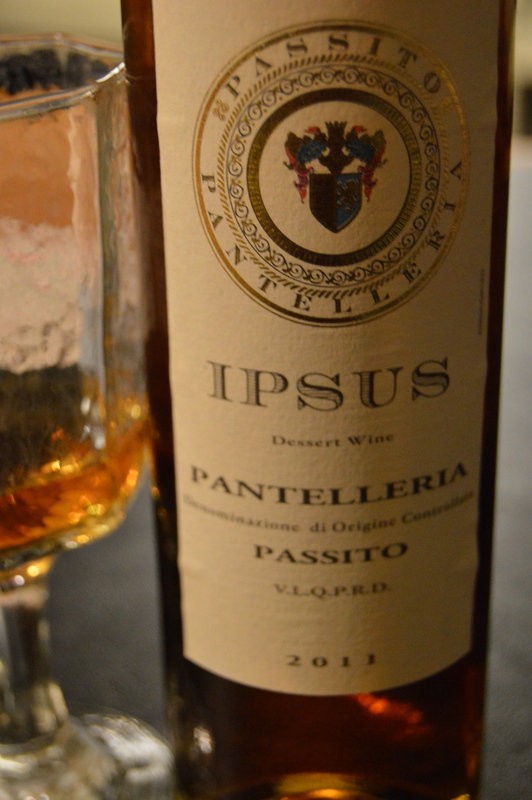 Ipsus, Pantelleria, Passito 2011 dessert wine (15% abv) was one of these $9 picks from Trader Joe’s. Great color (that of a bronzed sunset) and exotic location (the island of Pantelleria is in the middle of the Mediterranean between Sicily and Africa), its name was reminiscent of Icarus, the boy from Greek mythology, who flew too close to the sun. This wine does not exhibit same hubris as the boy–it’s not that aspiring or far reaching, but because of the lack of ambition, it doesn’t fully crash and burn, either. Perhaps I was ultimately swayed by my sweet tooth (the same one that likes Twinkies) but there was a flavor and sweetness combination I enjoyed, as if this was the wine version of “trail mix”—there was a little something of the earth to take the sweetness down a couple of pegs. If you like sweet wines and are adventurous, I say give this a whirl! It adds a nice finish to dinner, without breaking the bank, and it’s nice to have a small glass to transition to night. I may not serve it at a dinner party with wine connoisseurs, however. You will crash and burn.